Seattle has over 90 unique neighborhoods. 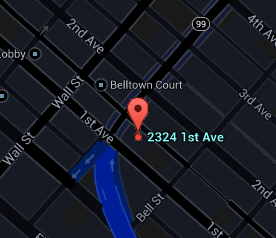 The location of Austin Bell is in the area known as Belltown. Every building has its own personality and attributes. The community is an important aspect of city living and can have an impact on how integrated it is with the residences. The Austin Bell building features can be explored here. A full list of amenities within the complex is displayed to help understand the offerings of the project. Austin Bell is a Seattle condominium building with a touching story. Built in 1889 by the family for which Belltown is named, the building was originally a hotel. Although Austin Bell passed away before he was able to complete the hotel, Mrs. Bell finished the project using bricks she barged in from San Francisco. Except for the stone façade, the building was almost completely destroyed by a fire in 1981. Developers Wayne Knowles and Bob Baldwin purchased the building along with a neighboring parking structure from Samis Land Company. Working in association with Cassimar US, Murray Franklyn and Snell Partnership, the award-winning renovated Austin Bell is now a loft-style condominium community with pieces of the original woodwork still decorating in the lobby. The 5-story, historic structure is located in the center of Belltown and also includes a rooftop terrace, a Starbucks outlet and additional retail space. All active, contingent, pending, and sold listings for the Austin Bell building. The Stroupe Group specializes in downtown Seattle condominiums. All the articles that have been published by the Stroupe Group concerning Austin Bell and Belltown can be found here.